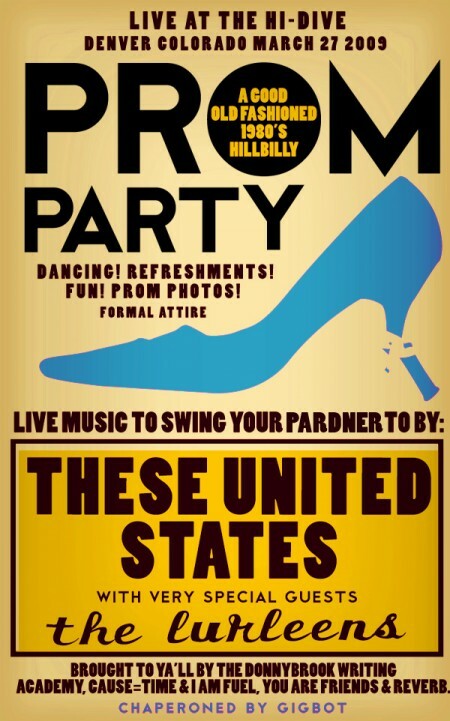 Hillbilly Prom this Friday with These United States! I saw These United States twice in Austin and their live set absolutely crackled with rough and rowdy energy. They are the perfect headliners for our First Annual Denver Hillbilly Prom this Friday night at the Hi-Dive. I am wearing a peach and white striped Gunne Sax/Jessica McClintock dress from the early ’80s and –of course– my cowboy boots. Tagged with denver, these united states, todd roeth. I saw them in LA last year and they were great. You had to go and hog three dates for CO, did you? I actually really like this album (the one this song came off of) much more than the first. I dig hard on that country vibe … and sometimes his flow is so good, you’d swear he was a silver-tongued rapper in another life. Really great blog. I’m bowing semi curtsied. Please, we’ll need to see pix from the Prom! Lexington has a lot of love for these guys. I catch them every time they play Al’s Bar, they are always a great live show.